All butter croissants or bagels are filled with scrambled eggs, American or cheddar cheese and your choice: breakfast sausage, crispy bacon, premium ham or steak. 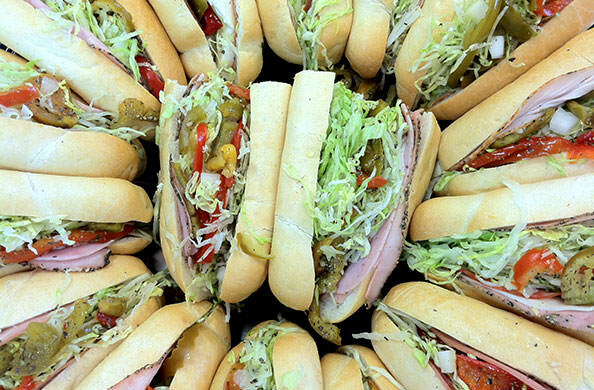 Assortment of sandwiches or deli subs. Your choice of 3 Boar’s head meats and 2 cheeses accompanied by coleslaw and potato salad complete with fresh bread, pickles and condiments. An extra-large 6 ft. sub freshly baked especially for you. 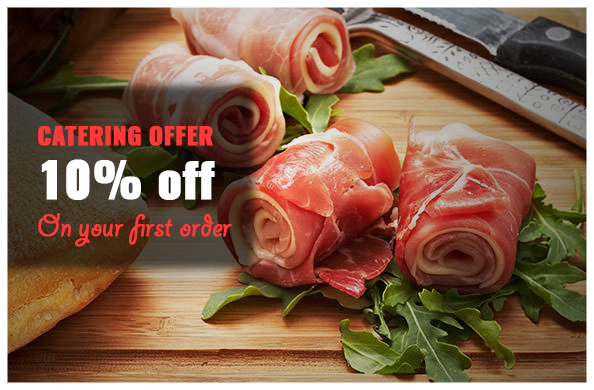 Choose from many of our deli meats: turkey, Italian, ham or roast beef. (Serves 22 people). A selection of seasonal fruits arranged on a tray. A selection of our fresh-baked cookies and brownies arranged on a tray. A selection of our fresh vegetables with your choice of dressing. Tossed garden salad topped with ham, turkey and provolone cheese. Crispy romaine Caesar salad with marinated chicken breast. Mixed green salad with feta. Traditional sandwich tray, salad tray, assorted dessert tray, chips and pickles. Deluxe sandwich tray, fresh fruit tray, salad tray, assorted dessert tray, chips and can of soda. Scrambled eggs, melted cheddar cheese and your choice of premium sliced ham, breakfast sausage or crispy bacon served with butter croissants, bagels and english muffins. Add fresh fruit for 8.99/person. Assortment of fresh bagels accom- panied by cream cheese, butter and jelly. Add fresh fruit for 6.99/person. Each box comes with chips and choice of fresh-baked cookie. Premium ham and oven-roasted turkey breast layered between multi-grain wheat bread with bacon, lettuce, tomato and American cheese. Choice of any Italian sub on soft roll with lettuce, onion, sweet peppers, oil and vinegar.